Throughout one’s Air Cadet Career, it is possible to receive a total of eight Air Cadet Medals. The criteria for receiving them range from four years of service in the Program to “extraordinary bravery” in the act of saving someone. It is also possible for cadets to receive and wear medals that are a part of the Official Canadian Medals & Honours System. This is subject to the CO’s approval. All Cadet medals are worn over your right breast pocket, under the name-tag. Medals that are a part of the Canadian Medals & Honours system are worn over your left breast pocket. It is illegal in Canada to wear medals not earned by oneself; even if they were earned by relatives. Medals are worn in order of precedence; with the highest ranking medals worn closest to the centre of the chest and above other medals. Cadet medals are worn in rows of three. The medals listed below are shown in order of least importance to most importance. The Air Cadet League of Canada has created an award to recognize continuous meritorious cadet service of at least four years by deserving air cadets. To qualify for this award, a serving cadet must have successfully completed four years of honourable service with no serious infractions, and be recommended by the Cadet Squadron Commanding Officer. Furthermore, eligible service is portable between air cadet squadrons. Air Cadets are also eligible to receive a Bar for the Air Cadet Service Medal for each year of training completed beyond the four year qualifying period. A rosette will also be provided for the undress ribbon. The Order of St. George will award a medal to honour Staff Cadets who distinguish themselves in their exemplary contribution at a CTC or at a Junior Canadian Ranger Enhanced Training Session during the summer training period. The Army, Navy and Air Force Veterans in Canada (ANAVETS), as a legacy to its desire to promote excellence and awareness of the Canadian Cadet Organization (CCO), have established the ANAVETS Cadet Medal of Merit). One medal will be awarded to the top cadet, male or female for each course listed below at each CSTC even if the cadet has already received the ANAVETS Cadet Medal of Merit for another course. Cadets who receive more than one ANAVETS medal are authorized to wear only one ANAVETS medal on their uniform. The Air Force Association of Canada (AFAC) has established annual awards to be presented to Air cadets for excellence demonstrated on the Glider Pilot Scholarship (GPS) and the Power Pilot Scholarship (PPS). One medal shall be awarded to the top cadet, male or female, on both the GPS and the PPS at each of the five Regional Gliding Schools; this means five medals for the GPS and five medals for the PPS for a total of ten medals each year. The Royal Canadian Legion (RCL) Cadet Medal of Excellence is awarded in recognition for individual endeavours in citizenship that meet or enhance the aims and objectives of the cadet movement. The Royal Canadian Legion sponsors the program. Met all the requirements of the squadrons annual mandatory and optional training programs. Participated in a minimum of three community service events in addition to those supported by the cadet unit through its local corps / squadron program. Regarded by peers and superiors as exemplifying the model cadet. Cooperation with peers and subordinates. Promoting goodwill and morale within the squadron. Aiding in the development of group identity and cohesiveness. Supporting and assisting fellow squadron members. foster patriotism in cadets through the acquisition of a good knowledge of military matters. Have attended at least one summer training course of three weeks in duration. Have qualified to a training level not below level 3. Have met all the requirements of their squadron’s mandatory training program and attended at least 75% of the scheduled training parades in the year of nomination. Have met all requirements of their squadrons optional/support training program and participated inn at least 50% of scheduled activities in the year of nomination. Have completed three years as a cadet. The Cadet Certificate of Commendation may be awarded by the Canadian Forces to an Air Cadet for outstanding gallantry in saving lives or property of others. This pin is worn over the left breast pocket, below any Canadian Honours or pilot wings. Cadet Medals/Ribbons are worn on the right side of the chest, suspended immediately above, and centered with, the breast pocket of the Shirt or Tunic. 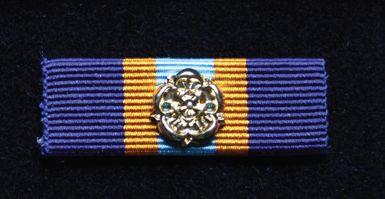 Cadet Medal/Ribbons are arranged with the award of most precedence closest to the centre of the chest. For more information regarding Cadet Medals and Ribbons, Refer to CATO 55-04 - Air Cadet Dress Instructions. The Colonel Robert Perron Fitness Award recognizes outstanding achievement in physical fitness. This National Award will be presented annually to the Cadet who attains the highest physical fitness test score. Cadets from the Army, Navy and Air elements are eligible to apply for this Award. Air Cadets who wish to apply for this Award should contact their Commanding Officer or Training Officer, who will provide pertinent information about the Award and, where applicable, arrange for the Cadet to be tested in accordance with established guidelines.